We are frequently asked the following questions about the Lifetime Family Package. If you have questions that are not listed below please e-mail us at: CustomerService@TheBEarthInstitute.com. We offer the Family Curriculum Package to our customers as a way for them to save money when they want to purchase curriculum for more than one student. By purchasing all the curriculum together instead of individually they save over 50%. 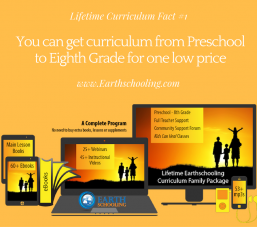 Since Earthschooling does not hold curriculum sales this is helpful to many parents/schools/teachers. People purchase the package and then immediately receive all their materials. At this point the transaction is done. There is no future financial commitment from the teacher/parent/school. There is no membership or membership fee. However, once you make a purchase we refer to you as “a member of the Earthschooling family”.